With Autumn soon upon us – fresh flowers from our garden will be history for those of us in Northern regions of the country. This always makes me a bit sad as I love fresh flowers and enjoy the ritual of going outside to my garden and clipping fresh blooms from it every week. To buy fresh flowers during the colder months can get costly, but I don't want to be without the cheery color pop flowers provide in my decor. In Autumn is when I turn to fake flowers. Yes – fake. Not old, dried, and dusty looking ones with ribbon bows. No – very nice silk ones that you can buy at Pottery Barn, Crate and Barrel, Craft Stores, and even The Dollar Store. Making fake flowers look more realistic is easy. Here are a few of the tricks I use. 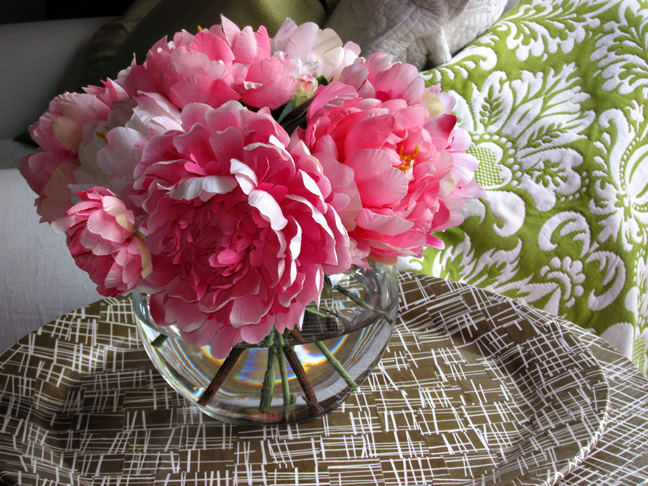 Pretend that a bunch of fake stems are real – simply add water to a glass vase. The water in the vase creates the illusion real flowers. 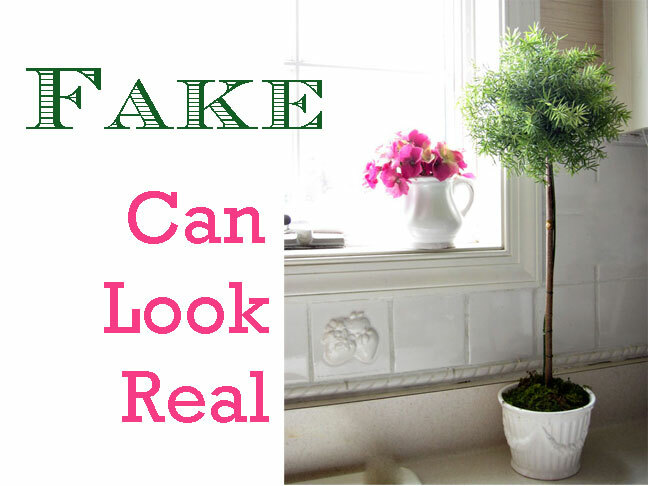 Fake blooms do have a few advantages – they never fade or wilt. You just need to change the water once a week so it always looks clean and clear. Mix in some real foliage with fake blossoms. Here I added some branches of dried leaves and dried lanterns that the chinese lantern plants that grow in my garden produce each autumn. 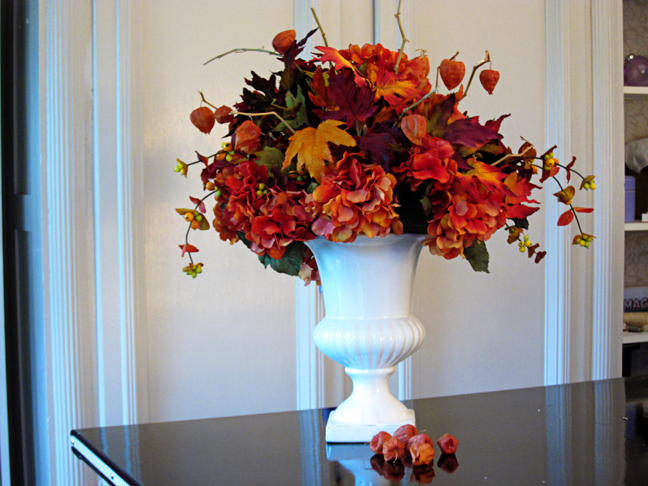 Place one type of flower in a few different colors in one large mass. 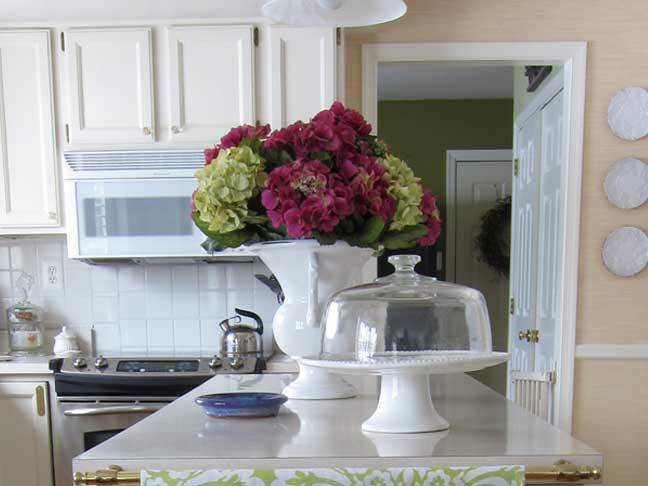 Here I used dark pink and light green hydrangeas in a classic white urn.